Yesterday my roomies proposed throwing a Halloween party. Awesome, right? Well, not if you're Korra-who backed out of throwing both her quinceanera and her sweet 16 because she had a panic attack about the guest list. Also not if you're afraid none of the people you invited will show because it is a weeknight and the event was decided kind of last minute and you don't have many friends you'd count on to come in the first place. I sent out maybe 7 texts last night and only three have responded- 2 nos and 1 "oh, that sounds interesting." This is not doing much to change my perception of myself as an unlovable friendless loser. 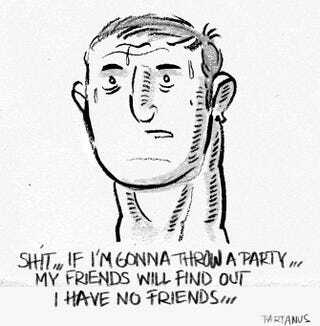 I already was panicking about being alone on my 2nd favorite holiday of the year, now I'm panicking about being alone yet unable to retreat to the sanctity of my room, bawl my eyes out in the dark, then pretend to be perfectly well-adjusted when my roommates return (like I normally do).